PAT410 perfect for those content to bond test solely at 200 mA, The smallest, lightest of the PAT400 series weighs only 2.7 kg. PAT420 offers bond testing at all three currents, 200 mA, 10 A and 25 A and 230 V and 110 V operation. 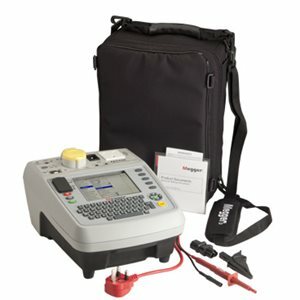 This tester is the choice of those who are full-time industrial or commercial PAT testers. PAT450 in addition to the three bond test and 230 V and 110 V operation this tester offers 1.5 kV and 3.0 kV flash testing making the perfect tool for hire and repair workshops. Find out about FormFiller a FREE certification for Portable Appliance Testing package by clicking here. There is a legal requirement for any landlord, employer or owner of a place of work or public place, to ensure that all electrical equipment accessible by tenants, employees or the public is maintained in a safe condition, and an acceptable method of ensuring this is by routine electrical testing. This can be performed by electrical contractors, specialist PAT testing organisations, maintenance departments, facilities management companies or in fact, any competent person who has suitable knowledge and training in portable appliance testing. The PAT400 range is suitable for performing portable appliance testing in locations such as hotels, public houses, schools, colleges, nurseries, shops, offices, theatres, banks, restaurants, cafés, sports and leisure facilities, cinemas, factories and hair salons etc. where high volume testing requires that accurate records may be difficult to maintain, or aided by, on-board memory and download to management software. The PAT450 is particularly suitable for use in tool-hire shops where equipment is routinely tested prior to hire, or service workshops where deep disassembly is routine, and will perform a flash test in addition to standard PAT tests.